TUMS Healthy oyster reefs with large, long-lived oysters can help buffer the acidity of estuarine waters in Chesapeake Bay and other coastal ecosystems worldwide. Image courtesy of VIMS. Reef Structure The internal physical and geochemical structure of oyster reefs is poorly understood. In addition to oysters, other shell-forming organisms may also play an important role in creating and maintaining the reef structure, but these interactions and their effects on a reef's geochemistry and physical structure are poorly known. Image courtesy of Dr. Roger Mann and colleagues. Shell Accounting A simple accounting of the harvest and replacement of oyster shell in the Maryland portion of Chesapeake Bay, in millions of bushels by year. Dredged Replace: shells from the MD dredged-shell program. Fresh Replace: shells from the fresh-shell planting program. Running Budget tallies removed versus replaced shells showing the positive effect of the replacement programs on the overall shell budget. Note that this budget does not account for degradation of shells in the bay. Image courtesy of Maryland Department of Natural Resources. 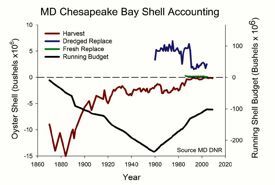 Blowing Shell Chesapeake Bay's oyster fishery removed significant amounts of shell and reef framework. Scientists have identified many benefits for restoring oyster reefs to Chesapeake Bay and other coastal ecosystems. Oysters filter and clean the water, provide habitat for their own young and for other species, and sustain both watermen and seafood lovers. A new study co-authored by Professor Roger Mann of the Virginia Institute of Marine Science adds another item to this list of benefits—the ability of oyster reefs to buffer the increasing acidity of ocean waters. The study, “Ecosystem effects of shell aggregations and cycling in coastal waters: An example of Chesapeake Bay oyster reefs,” appears in Ecology, the flagship journal of the Ecological Society of America. It is co-authored by George Waldbusser of Oregon State University and Eric Powell of the Haskin Shellfish Research Laboratory at Rutgers University. Concerns about increasing acidity in Chesapeake Bay and the global ocean stem from human inputs of carbon dioxide to seawater—either through the burning of fossil fuels or runoff of excess nutrients from land. The latter over-fertilizes marine plants and ultimately leads to increased respiration by plankton-filtering oysters and bacteria. In either case, adding carbon dioxide to water produces carbonic acid, a process that has increased ocean acidity by more than 30% since the start of the Industrial Revolution. A more acidic ocean concerns marine-life experts, who cite its corrosive effects on the calcium carbonate shells of oysters, clams, and other mollusks, as well as its possible physiological effects on the larvae of fish and other marine creatures. At current rates of increase, ocean acidity is predicted to double by 2100. 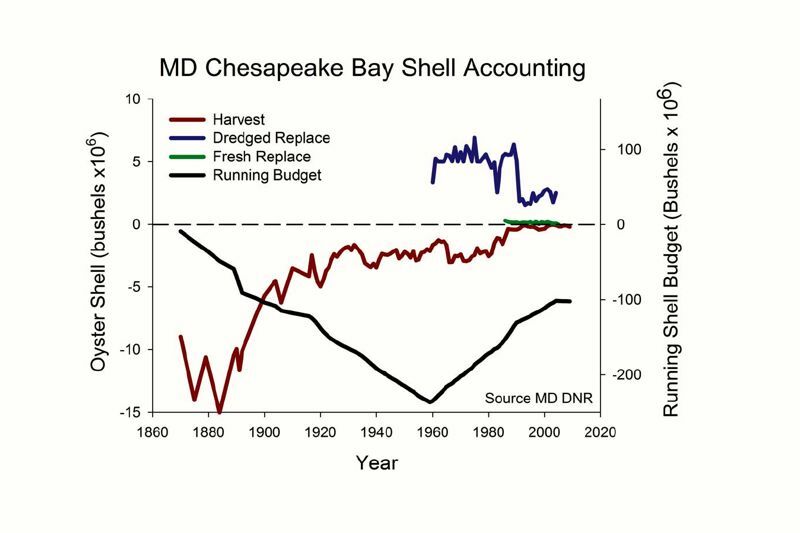 The Ecology paper reports on the research team’s efforts to calculate past and present shell budgets for Chesapeake Bay, with a goal of estimating how effective healthy oyster reefs might be in moderating ocean acidity, and whether today’s depleted reefs can withstand future acidity increases. The team’s calculations suggest that in 1870—before people began large-scale harvesting of oyster meat and shells from the Chesapeake—the amount of oyster shell exposed to Bay waters was more than 100 times greater than today, with an equally enhanced capacity to buffer acidity. Returning oyster shells to Bay waters—a practice that began in earnest in the 1960s to restore reefs for food and filtering—has helped buffer acidity in the Bay, but to nowhere near historical levels. 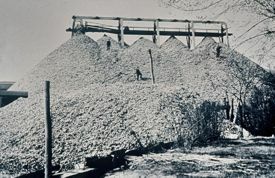 Waldbusser's estimate of a shell budget for Maryland waters shows that shell replenishment through dredging and restaurant recycling has made up for about half of the 200-million plus bushels of oyster shell lost to harvest between 1880 and 1960, still leaving the Maryland portion of the Bay 100 million bushels shy of its pre-harvest resource. The study by Mann and his colleagues estimates that oysters now contribute only 4% to buffering of acidity baywide, whereas they were responsible for 70% of all baywide buffering in 1870. Looking towards the future, the team’s concern is that oyster reefs in the modern Bay—fewer and smaller than their pre-harvest counterparts and featuring smaller oysters—may be unable to keep pace with the increasing acidity of Bay waters.